Climate change is now affecting every country on every continent. It is disrupting national economies and affecting lives, costing people, communities and countries dearly. The disruption and costs will be even greater in future. People are experiencing significant impacts of climate change, including changing weather patterns, rising sea level, and the increased occurrence of extreme weather events. Forests play an essential role in climate regulation both locally and as part of the water cycle. Alongside oceans, forests are the key ecosystem that removes carbon dioxide from the atmosphere and carbon is stored in both trees and forest soils. The world’s forests contain roughly as much carbon as the atmosphere and the destruction of forest systems contributes to one-sixth of global carbon emissions. Ending the loss and degradation of forest systems and promoting sustainable management and restoration programmes are key to achieving positive climate action. Forests have great potential to contribute to future mitigation of climate changes and to limit the harmful consequences of climate change. 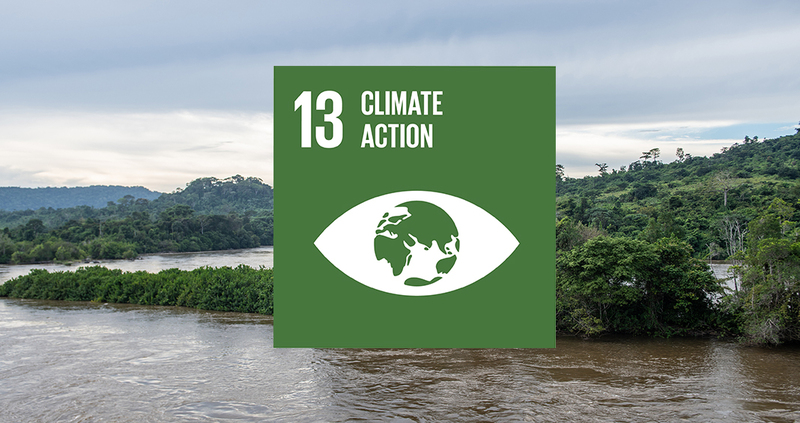 FSC contributes to the achievement of goal 13 of climate action in several ways. FSC gives special attention to protecting the function of forests as net removers of CO2 from the atmosphere. In terms of carbon in wood products, FSC’s certification scheme for forest management, its chain of custody control standards, and its outreach to consumers through its labels, all contribute to mitigating climate change by promoting sustainable forest management, and the recycling of wood materials. FSC only grants certificates to foresters who manage infrastructural development, transport and silvicultural activities so that water resources and soils are protected. Contrary to many agriculture practices, FSC does not accept significant disturbances to forest soils. • 10.10 The Organization shall manage infrastructural development, transport activities and silviculture so that water resources and soils are protected, and disturbance of and damage to rare and threatened species, habitats, ecosystems and landscape values are prevented, mitigated and/or repaired. o HCV 4 - Critical ecosystem services. Basic ecosystem services* in critical situations, including protection of water catchments and control of erosion of vulnerable soils and slopes. • Acceptance of reclaimed wood and paper in FSC certified products. • Information and awareness through FSC labels and claims.